Chapter Meetings are usually held on the second Monday of the month (during the school calendar). Meeting times are typically scheduled from 5:00 - 7:00 p.m. Beta Beta Chapter Welcomes New Members! It is exciting to see so many dedicate themselves to nursing excellence through membership in Sigma. The Beta Beta Chapter recently held an induction ceremony for new members. The stories, the food, and the company were so enjoyable! Apply Now for 3 Monetary Awards! The Excellence Award, for Beta Beta members who consistently practice excellence in a clinical setting, nursing education, or nursing leadership. The Research Grant is also available for new and experienced researchers. The Scholarship Award recognizes outstanding scholarship by qualified nurses that will advance knowledge in nursing science and practice. Find application forms under the "resources" drop down menu in the purple banner at the top of the page. Sigma member Margaret Wright is a Clinical Research Nurse Coordinator with UT Southwest Medical Center. She recently presented "Safe Care for Patients Enrolled in Clinical Trials: An Ethical Approach" to TWU faculty across three campuses. Thanks to Dr. Bailey, Chapter President, for putting us in touch with this clinical expert and proud member of our Beta Beta Chpater. Members of the Beta Beta leadership team met with nursing students in January to explain the many benefits of a Sigma membership. Beta-Beta Members Make International Connections! Beta Beta members offered breakfast to Nursing, OT, and PT students during finals week at Texas Woman's University. We also promoted Sigma membership at our early morning "Food for Thought" event. Chapter leader Aleatha Rossler, MS, RN, presented "Turning Millenials into Geriatric Nurses" at our Founder's Day event. She also shared adorable kangaroo pictures from her recent trip to Australia when she presented at Sigma's International Research Conference! 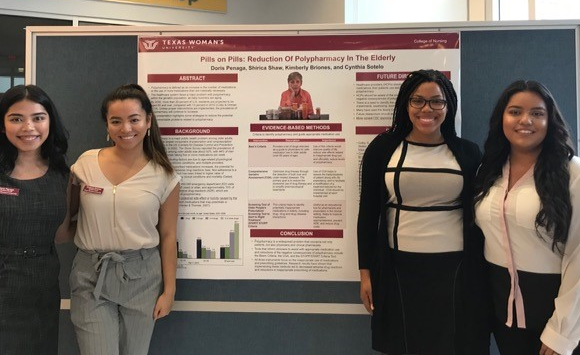 TWU nursing students also presented EBP posters on important geriatric topics. Two Beta Beta STTI board members, Drs. Kathy Bailey (President) and Colleen Halverson (Co-Chair Publicity), represented Beta Beta when they attended The 2nd Annual International Neuroscience Nursing Research Symposium on August 11, 2018 at the Hilton Anatole in Dallas. The focus of the symposium was on key aspects of neuroscience nursing research. See a picture and the full story by clicking on "Resources" then "Photos" at the top of the page.